Almost one hundred years ago, towards the start of the last century, a small family-run company started inventing and revolutionizing the baking world. 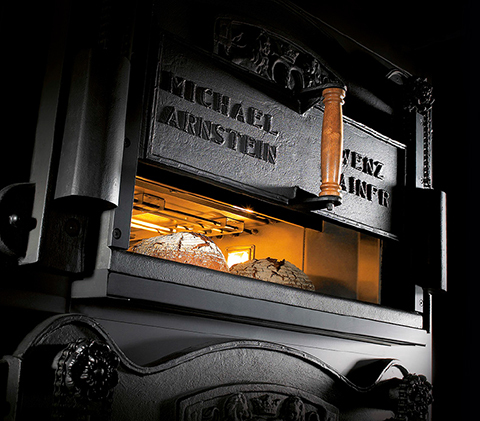 The company known as MIWE was founded by inventor Michael Wenz when he created his first oven in 1919 in his hometown of Arnstein, Germany. The business steadily grew and in 1951, the company was passed down to his son Professor Dr. Edgar M. Wenz, who took over as CEO. Today, the leadership reigns are in the hands of the third generation of the Wenz family: Sabine Michaela Wenz has been managing the growing company since 2002. She has transformed the successful family enterprise from its artisan roots into a modern company with business operations around the world and a highly promising future. MIWE’s objective has always been simple: to provide bakers with the support they need to be successful in their market environment with great bakery products and snacks. The company achieves this by focusing on the specialized products, processes, wishes and requirements of each individual customer. Coupled with this, MIWE also focuses on developing innovative, technically and technologically leading solutions to provide their clients with the best customer benefit and greatest value for their money. This kind of approach is crucial as bakeries and stores are complex mechanisms that require the right balance of procedures, quantities, time, quality and most importantly cost. MIWE’s unique customer journey begins by carefully listening to the needs of its clients, assessing their current and target situations and then drawing on decades of practical experience from its master bakers and dough experts to develop a concept which fulfils their clients’ expectations. This unique approach is termed ‘smart engineering’, which is a process that transcends the technical department and also applies to the service department. Here, highly qualified specialists and state-of-the-art resource planning tools ensure rapid availability and high quality performance of all jobs. There is reason enough to say that at MIWE, it is all about the customers. From its inception, MIWE has developed a solid reputation in the baking industry as a manufacturer of excellent ovens for bakeries and stores. 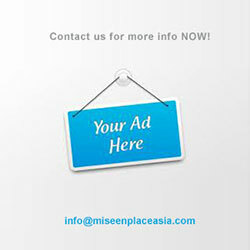 Over the past few years, the company has added to its experience by expanding its range of equipment. 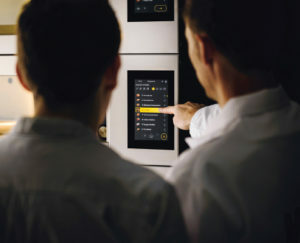 Throughout the production chain is its interconnected layout and systems, which offer a large range of benefits over conventional systems including optimally integrated processes, reduced interface challenges, consistent and uniform control logic and significantly improved overview. In short: smoothly running processes. At MIWE, the core competence lies in the climatic conditioning of dough. Not only has it mastered the art of perfectly regulating the interplay of temperature and moisture, but also proofing, cooling and freezing. Going beyond the technical aspects of baking, MIWE also offers individualized solutions for customers given their portfolio of bakery proofing and refrigeration units of all kinds and sizes. This also applies to chain-linking with their well-established range of transport and loading solutions. Furthermore, MIWE has made matters of energy a cornerstone of its business, as demonstrated by its commitment to making baking energy efficient. As a pioneer and market leader in this field, this family-run company has been able to help customers achieve this goal of energy efficiency through the intelligent linking of energy sources and consumers to help create a minimal energy input network. In addition, MIWE also helps customers achieve a seamless, secure integration of systems to data networks to deliver the tools necessary for data analysis and decision-making. Quality excellence is a given in any business, but MIWE has always gone the extra mile to ensure that quality excellence is practiced right from the start and incorporated at all levels. MIWE has set some simple goals to provide its customers with optimal tools, products and services: namely, reliably good baking results, simple and safe operations, best availability during heavy day use, optimal hygiene, flexible utilization and manageable life cycle costs. This excellent quality of MIWE is also translated to their range of products through their excellent manufacturing quality, from the purposefully clear and clean design, to the premium materials used right up to the flawless build of all parts and components. The bottom line is, not only does this lead to better usability and practical durability, but also the pleasure of having and working with MIWE systems. Therefore, it should come as no surprise that MIWE’s quality management is certified according to DIN EN ISO 9001:2015. At the backbone of the quality concept for customers is the commitment and professional expertise of MIWE’s employees. The company heavily invests in the continuous professional training and qualification of their specialists in order to give its customers not just the best alternative but the best products overall. Apart from being sticklers for quality, MIWE has remained loyal to their two production sites in Germany i.e. the Lower Franconian town of Arnstein near Würzburg, and in the nearby small city of Meiningen. From these two locations, MIWE has been able to easily find qualified employees that are necessary to achieve the company’s quality and innovation goals. This is in part due to the close proximity of these towns to the universities in Würzburg and Schweinfurt that produce a steady flow of graduates. MIWE’s location in Central Europe also provides other advantages, such as good infrastructure as well as the availability of a range of high-quality suppliers in the region. It is also no secret that Europe, and especially Germany, has a strong baking culture and this lends itself to a rich variety for MIWE to choose their baking expertise from. Given this strong and prominent heritage, all products in the MIWE range proudly carry the ‘Made in Germany’ label. But this by no means suggests that MIWE is an isolated company; with eight subsidiaries and a globally positioned dealer and service network, they are present and firmly established in all parts of the world. The MIWE family brand is neatly organised into two branches to ensure maximum business efficiency. This enhances MIWE commitment to customer focus, as they are able to deal with individual questions and requirements of various customer groups. The first of these two distinct groups is the business division baking stations (BS), which is dedicated to in-store baking and all its related processes and procedures. The second of the two branches of the MIWE family is the business division for bakery plants (BA), which serves all shapes and sizes of production bakery, from the artisanally organized operation to the shop floors of (semi-)industrial bread, cake and pastry production. Despite being two distinct divisions, one underlying thread binds the two, i.e. the superior mastery of all climatic processes of baking and their smooth catenation. Having an overview and control range covering baking processes from production down to in-store sales allows MIWE to offer better expert support in both worlds, especially at their interface. Technologically, MIWE systems are possibly one of the most sophisticated systems on the market. 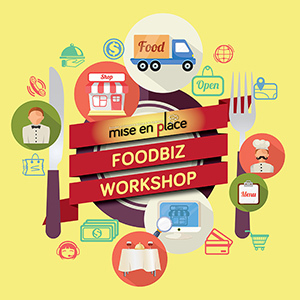 In fact, many innovations that fundamentally changed the baking world were inspired by MIWE’s initiative. The deck oven was invented and became a key cornerstone of the MIWE business upon its 1954 market release. In 1967, another key invention was achieved with the roll-out of the MIWE rotator (now MIWE roll-in), which led to a triumphant success of rack ovens in Central and Western Europe. One of MIWE’s greatest successes is the introduction of ‘sight-and-scent’ baking and the first in-store baking station originally developed by Prof. Dr. Edgar Michael Wenz to help increase sales for bakers. This achievement further propelled MIWE into the modern age with its first electricallyheated MIWE condo oven in 1972. Moving in the direction of modern innovation, MIWE introduced the MIWE CS – the first computer-controlled system in 1983. 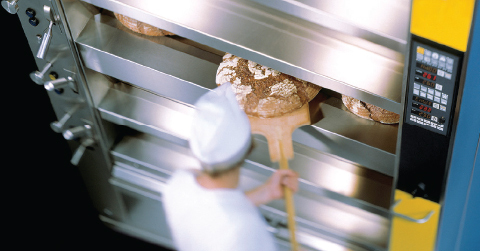 In 1987, MIWE’s back CAB software enabled the first networked bakery to be established. However, the heart of MIWE lies in technical superiority and returning to this in 1990, MIWE developed the first direct baking processes for unproofed and other frozen dough pieces. 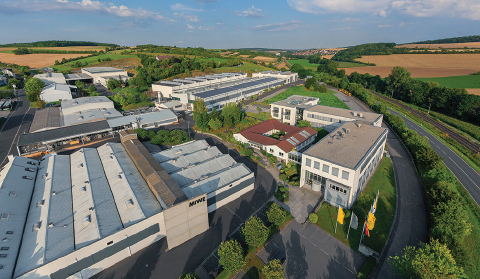 Seeing the need for more expansion, MIWE opened their second production facility in Meiningen, Germany in 1991. Another huge technological win for MIWE comes in 1992 with the development of the loader system MIWE athlet. This was further followed with the roll-out of the MIWE thermo-static in 1993, marking the beginning of thermal oil use. As the MIWE family continued to grow, a Bakery Refrigeration Division was set up in 1994. 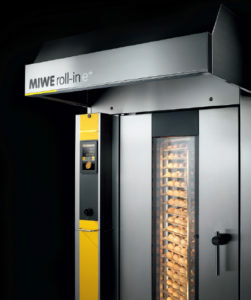 With the aid of technological advancement and progress, MIWE developed its very own self-learning baking control, MIWE flexbake, in 1995. MIWE continued to prove its position in the baking world when it patented its air volume control system, MIWE aircontrol for excellent crust formation. Almost a decade into the new millennium, MIWE embraced some new changes. 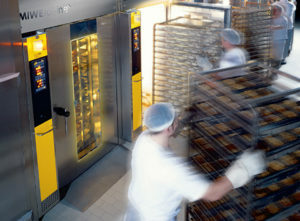 Not only did it become more energyconscious with the introduction of low energy bakeries but an operational re-organisation took place in 2010 with the introduction of the BA (bakery systems) and BS (baking stations) divisions. In 2014 and 2015, MIWE received industry recognition when it was certified according to the DIN ISO 5001 and DIN EN ISO 9001 systems. However, this was just the beginning because in 2016, MIWE was awarded ‘Brand of the Year’ for shop ovens (ABZ), and the Südback Trend Award (Atmospheric Baking). More excitingly, MIWE began the construction of its first live baking centre in 2017. The baking systems developed by MIWE are known to many as some of the most sophisticated baking systems on the market. Suffice it to say, it has been a long journey with many industry firsts for this family-run company. The in-store baking or ‘sight-and-scent baking’ method, which is now available in almost every bakery around the world, remains one of its greatest technological innovations. Also, many of the technologies without which in-store baking could never have become such a success story, e.g. ‘frostlingsbacken’, a special baking program for proofed frozen dough pieces, were also developed by MIWE. Another innovation brought to the baking world by the specialists at MIWE is the rack-oven, which was completely unheard of in central Europe and the rest of the world right up until the 1970s. Through hard work, perseverance and the development of ever more efficient ovens, MIWE convinced the baking world to step over its shadow and embrace the modern baking that the rack-oven heralded. Further innovations are the optimized steam technology MIWE atmojet and the ‘Atmospheric Baking’ invented by MIWE. This new technology ends two age-old issues which have plagued the baking industry: the weather effects and draft-induced effects on baking results. 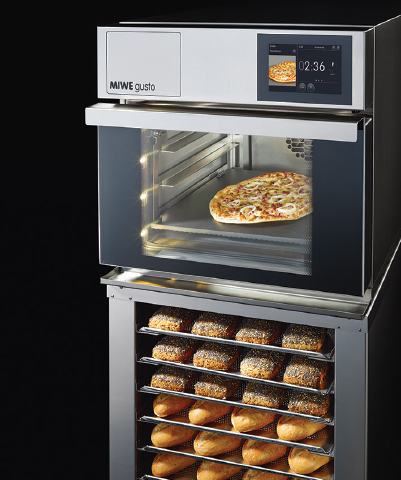 MIWE variobake is also another strong contender in the MIWE range with its ability to expand the available scope of baking characteristics in the deck oven. 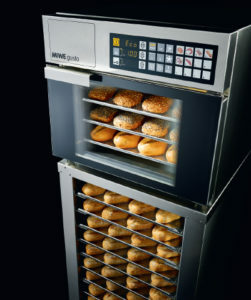 Some other examples of MIWE technological excellence are the aroma enhancing freezer technology MIWE smartproof™, the expansion of MIWE in-store baking systems to include special gastronomic functionalities, as well as the integration of vacuum conditioning into the manufacturing process. MIWE baking equipment is connected to the Internet via a secure access connection, and from there linked to an equally secure central data server. Bakers or kitchen staff with the authorisation to do so can enquire which products were baked when and in which branch, on which baking stations and in which oven; how much energy was used, when the baking stations were left unused and whether they were set to the energy saving Eco mode, switched off completely or operated at full heating capacity. At a glance, it can be seen whether a fault or other irregularities occurred and when, for example, maintenance work was carried out (and when it has to be carried out next time). The cycles in which cleaning processes were carried out can be verifiably documented at any time, thus creating wide-ranging analyses for the optimisation of branch outlets via the usage profile. To increase access possibilities to their baking stations, MIWE apps allow users to take control of their baking stations from afar via smartphone or tablet. 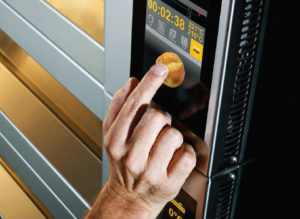 Through MIWE connectivity, bakeries are able to secure connections on all levels and are guaranteed to be part of a networked future from the very start. 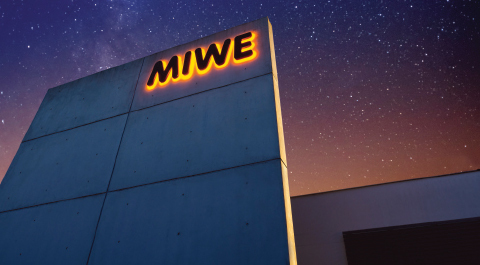 As a leading manufacturer of technologically advanced bakery equipment, MIWE has grown by leaps and bounds with annual sales exceeding 110 million Euros. This phenomenal and enviable financial success was achieved with around 750 employees, thus placing this family-run company amongst the oldest and internationally most successful players in the industry. Such a success story does not simply happen. It is the result of an enduring positioning towards addressing the ever new, individual wishes and needs of customers as well as a consistent focus on technological excellence, superior quality, innovation and unconditional reliability.